New application development tools and the IBM® service-oriented architecture capabilities for IMS™ can help your business improve the speed and agility of its development efforts. Both IMS and the IMS SOA Integration Suite support your on demand systems and your distributed IMS application environment. 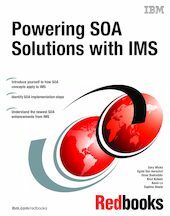 Powering SOA Solutions with IMS provides background and explanations to clarify the choices and methodologies that are available to modernize your IMS applications and provide access to IMS data stores through non-traditional callers.